Authorities are hunting for a man suspected of killing his aunt and uncle, shooting two police officers, stealing a patrol car and carjacking other vehicles in a violent rampage in the Oklahoma City area, all while apparently taunting law enforcement via social media. The officers were shot Sunday night as they responded to a report of shots fired in the town of Wellston, 35 miles northeast of Oklahoma City, according to the Lincoln County Sheriff’s Office. The officers’ injuries weren’t life-threatening, and both are expected to recover, said Oklahoma State Bureau of Investigation spokeswoman Jessica Brown. The Sheriff’s Department said one person was arrested after the shooting, but a second suspect, 38-year-old Michael Vance, fled in a patrol car. 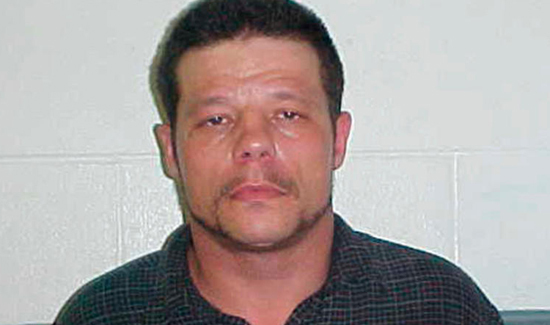 Vance is suspected of later shooting at a woman and stealing her vehicle at a mobile home park near Wellston, then driving 8 miles to the home of his aunt and uncle in Luther and killing them, Oklahoma County Sheriff’s Office spokesman Mark Opgrande said. Officers found the bodies of Ronald Everett Wilkson, 55, and Valerie Kay Wilkson, 54, at their mobile home Sunday evening, Opgrande said. Opgrande said authorities also believe Vance posted two live videos Sunday night on Facebook documenting his run from police before he went to the home of his aunt and uncle. In one video, a man wearing a backward baseball cap and a shirt that appears to be covered in blood says that he’s about to steal another vehicle and that it’s “gonna be intense.” In another that appears to be filmed inside a vehicle, the same man says: “Letting y’all know, look, this is real,” before panning across the vehicle to show a long gun on the passenger seat. Ronald Wilkson’s body was discovered outside the mobile home with a bullet wound and stab wounds to his neck “consistent with an attempt to sever his head,” Oklahoma County Sheriff’s Deputy Michael Belanger wrote in an arrest affidavit. Valerie Wilkson was found inside the mobile home with similar wounds to her neck along with defensive wounds on her arms, the affidavit states. Investigators found a large knife covered in blood inside the home, along with a blood-stained shirt that Vance appeared to be wearing when he filmed the Facebook videos. Authorities also found two shell casings from a round typically fired from an AK-47-style assault rifle.